Posted on May 21, 2015 by No Map Required Posted in Places, Tanzania	. Where to start!? Where to start!? 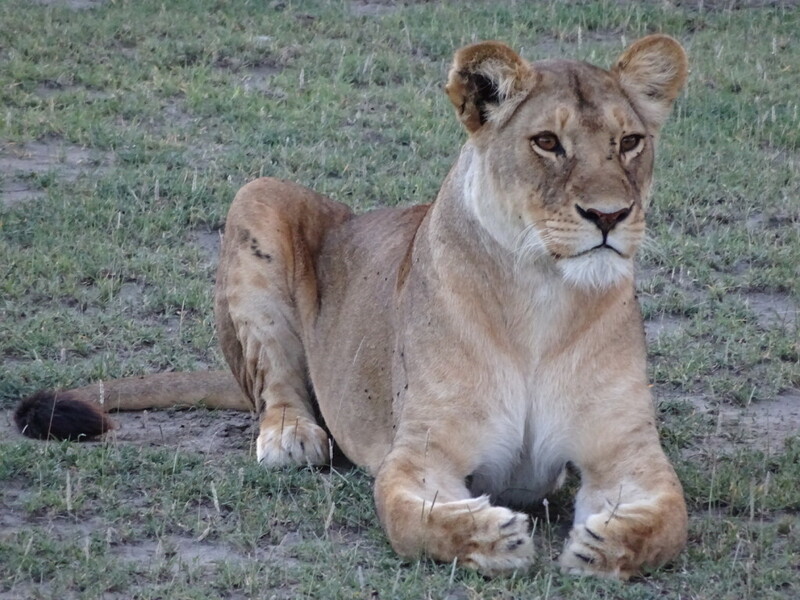 Okay, this is at least our 15th attempt to start writing about our safari – so I’m just going for it! This will be the first in a series of blogs to try and cover the high-points, but there’s no way to really describe the incredibleness of our safari, so I’m resolved to just do the best I can and urge you to drop everything you are doing right now and start planning your trip to Africa! Seeing The Great Migration in Africa was my one and only “pillar” (must-do-activity) of the big trip and I have to say that the safari was more awesome than the rest of the trip combined! At least I think so. 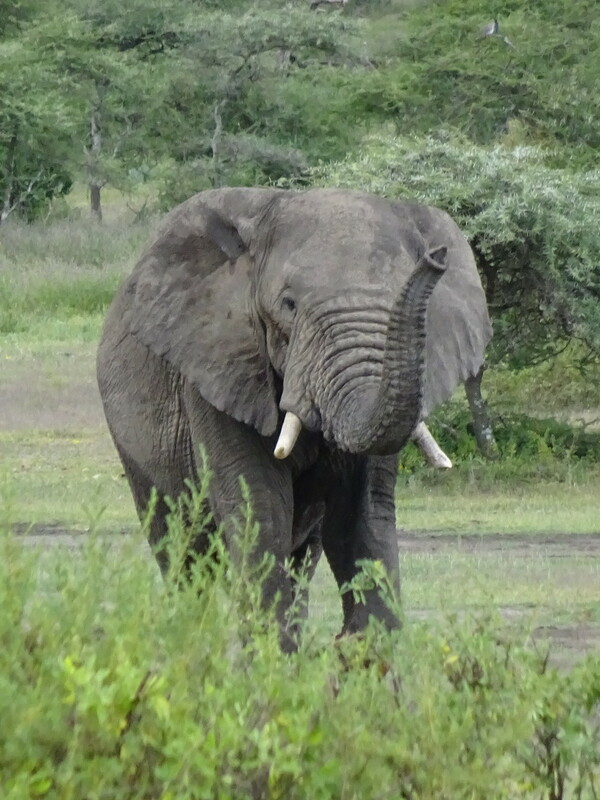 The safari, just the first part of our African excursion, was just AWESOME! Awesome is a word that is way over-used, but it seems the best. Awesome. Tremendous. Fantastic. Outstanding. Wonderful-Wonderful (as my step-day would say). Better than a sharp stick in the eye (as my dad and our safari leader would both say). Amazing. Indescribable. Mind blowing. Beyond words. Must see… pick an adjective and it doesn’t do it justice! 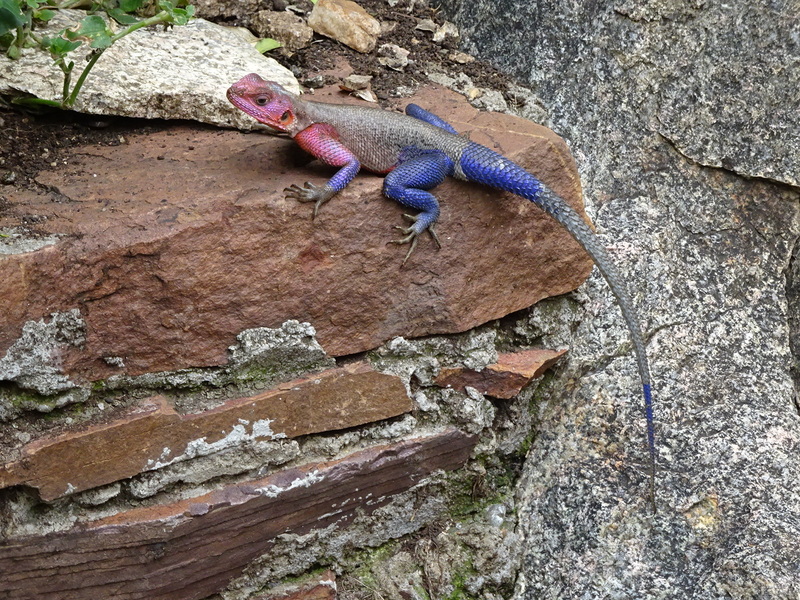 Agama Lizards – bet you thought we’d start with lions, but no! Let’s start small. These colorful guys are apparently the most common lizards in the area, though we only saw them in one spot. Sure are pretty, though! However did nature decide this coloration would be useful?? Dwarf Mongeese/Mongoose/Mongooses — not sure on the grammar. Not what you normally think of when you think “safari”, but they are lovable enough. 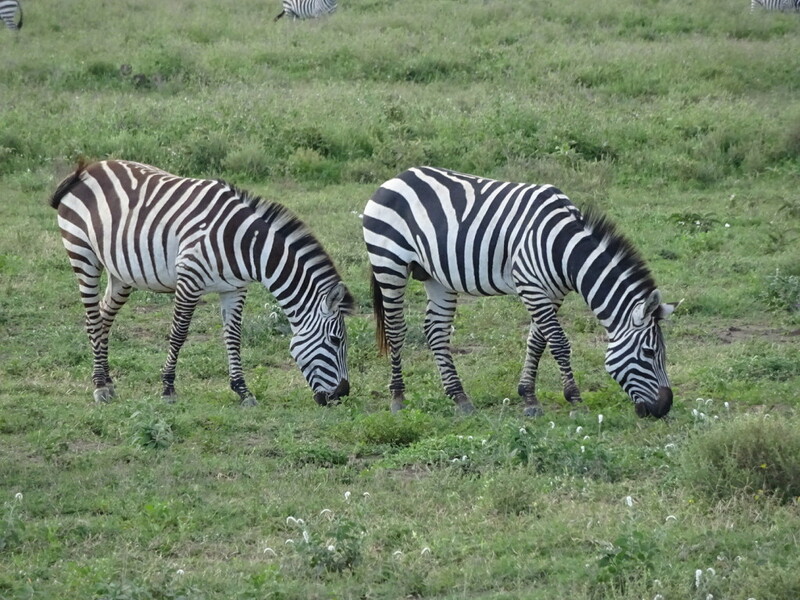 Not sure I would think so if they were living in my back yard, but on safari they were very fun to see. 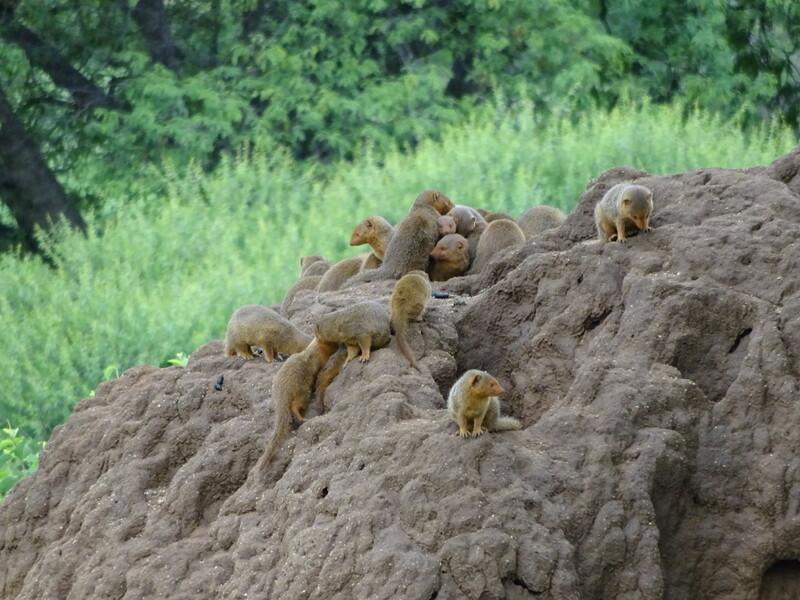 These dwarf mongeese are “playing” on a termite mound, which were everywhere we went! 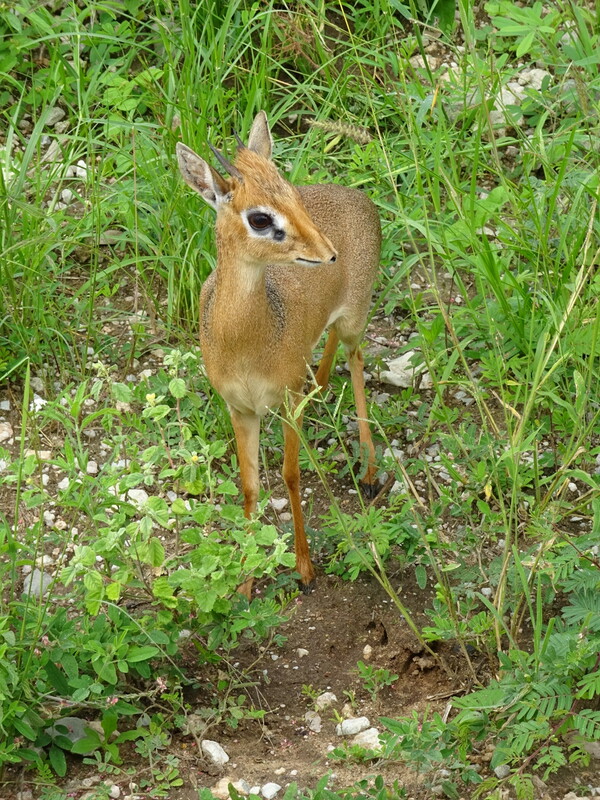 Kirk’s Dik Dik – not sure who Kirk was, or what it says that his name sake is the third smallest gazelle, but they sure are cute! He’s only about 2′ high! And check out those horns! They usually hang out in twos or threes. 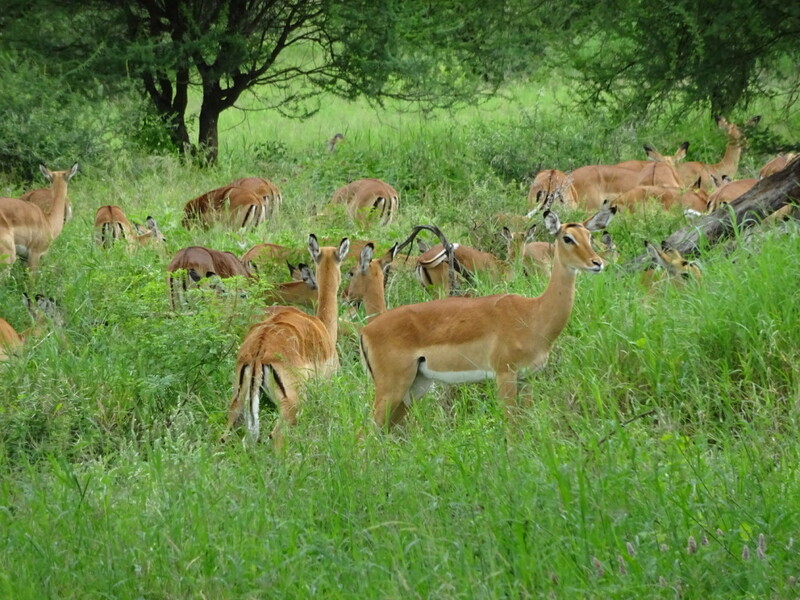 Impala – they live in bachelor and female herds. In the female herds, “harems”, there is one male and he spends all his time keeping the ladies in line and the other males out. Eventually he gets weak and needs to eat and another male will displace him. It’s like roulette, at some point some lucky male will be there when the harem comes into heat and BINGO who gets to father the next generation!? There you go! Giraffes! 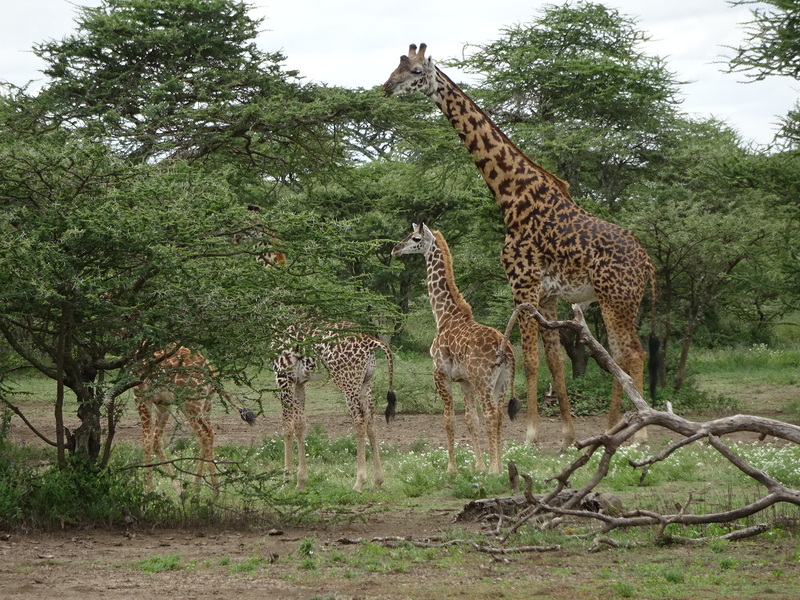 Can you believe that the very first animals we spotted were a herd of giraffes, about an hour out of Arusha and before we even got to a wildlife park? They were EVERYWHERE and always impressive to watch. When they lean down to drink water the blood vessels in their heads regulate the blood flow so they don’t pass out. 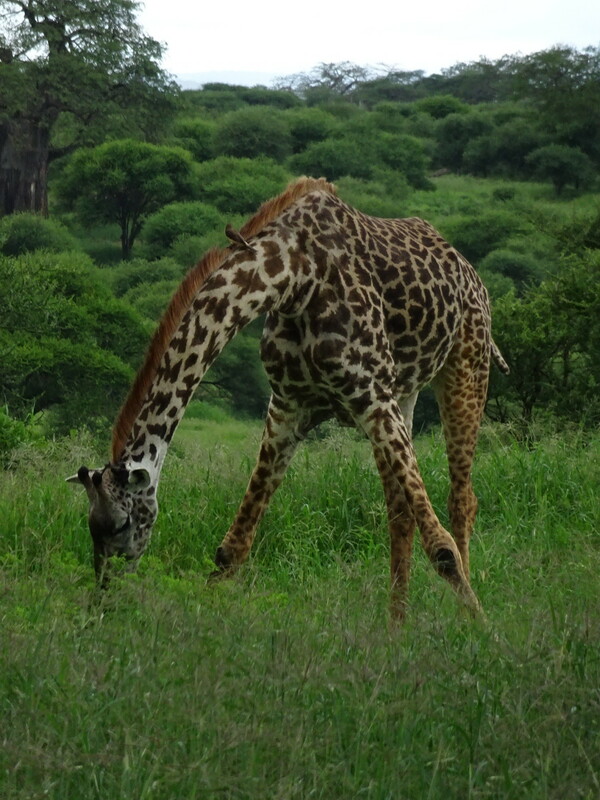 Drinking is a very vulnerable time for the giraffes and they have to be on the look out for predators. They also have baby-sitting service! One female might take a handful of kids so the rest of the adults can eat in peace. How great is that?! Zebras. They are like the Switzerland of the Serengeti. They seem to hang out with all the animals. 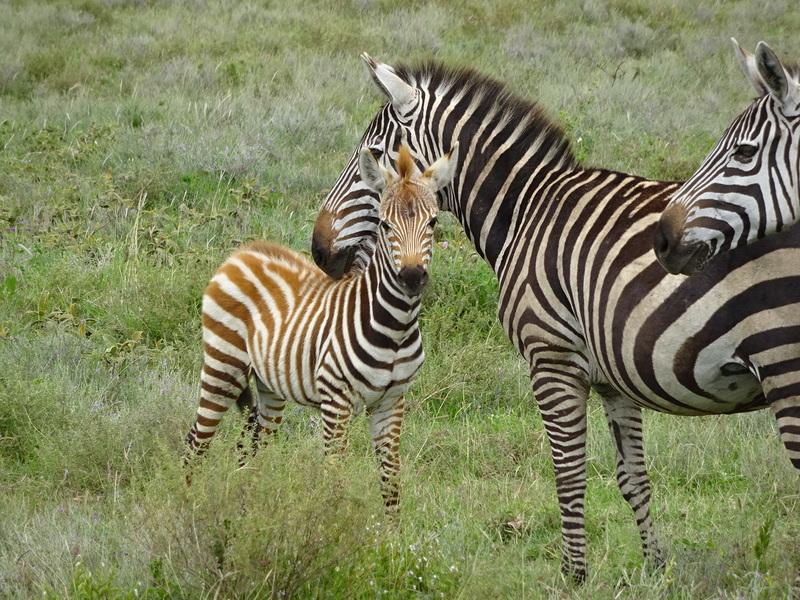 Ever notice how you see them head-to-toe, kind of like this baby and mama? That’s so they can be on look-out in case there are any predators around. 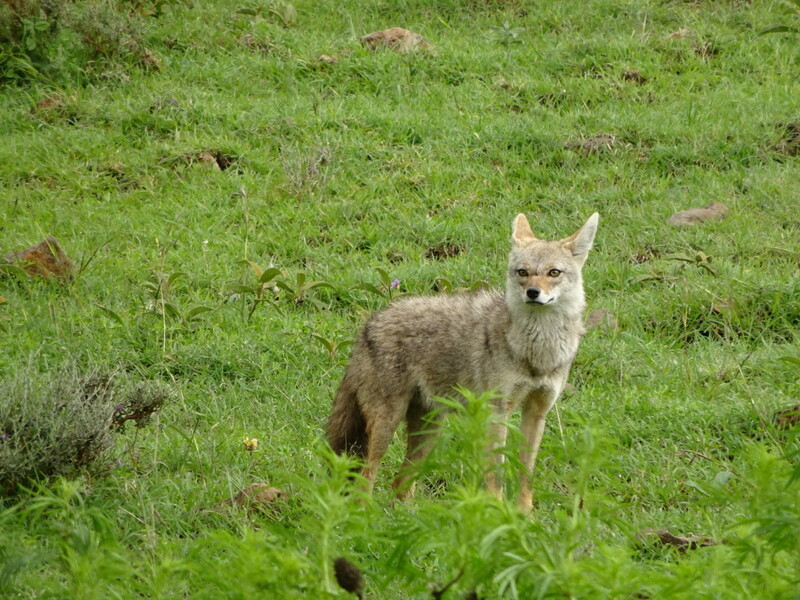 They have great eye sight, so it matches well with other prey animals that have poor sight, but great hearing or smell! Another interesting thing? 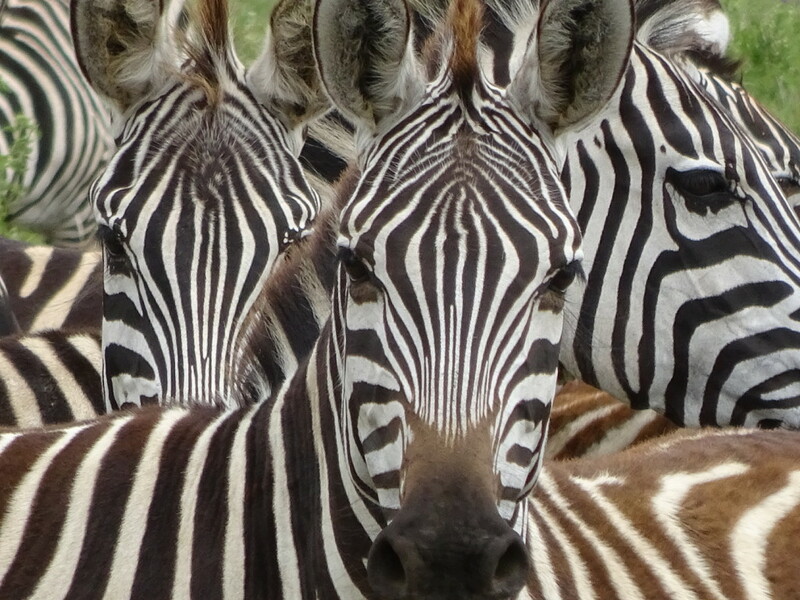 Every giraffe’s spots and zebra’s stripes are unique to that particular animal, just like our finger prints! Ahhhh, the Dung Beetle. File this under “all creatures great and small.” Even the little dung beetle is important. 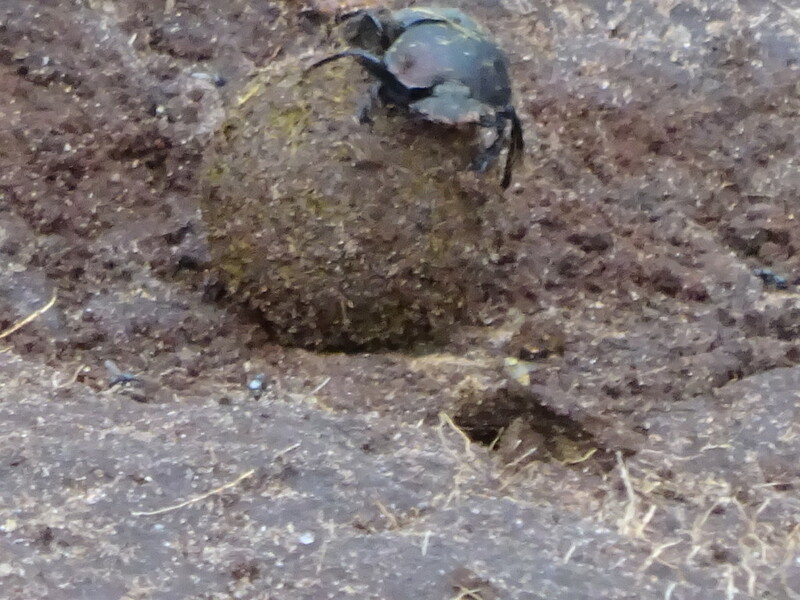 The male makes a dung ball, the female lays her eggs in it, then it is rolled to a hiding place. In the process, the dung is recycled, eventually breaking down into the soil. Just imagine all the poop on the plains and then you are suddenly very happy to have over 100 varieties of dung beetles hard at work! Incredible fact: scientists have shown that dung beetles navigate by the stars!! Seriously. I couldn’t believe it either! They’ve been studied in planetariums and when the displayed stars are removed or mixed up, suddenly the dung beetles can’t find their way home. Our group seemed especially fond of this little guy. Check him out in this video. Lions! Now that’s more what you were hoping for, I know! They are pretty amazing creatures. 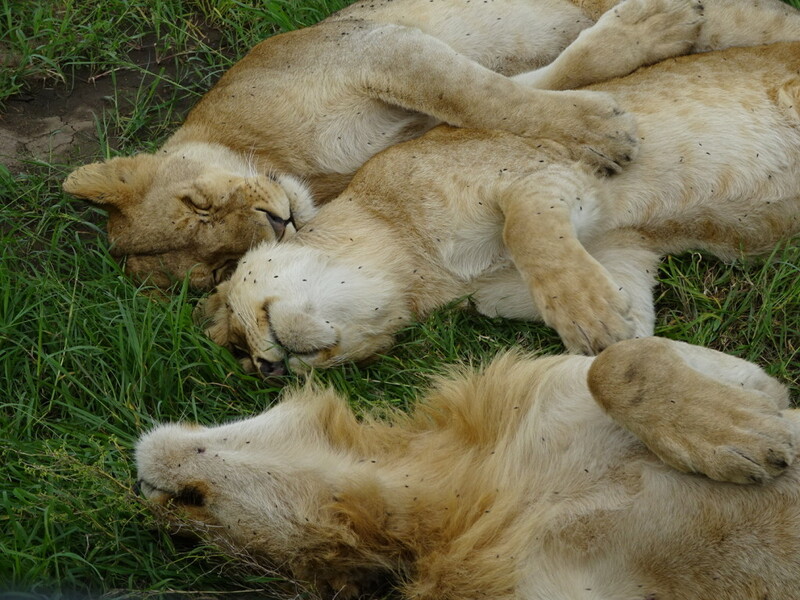 If a lioness’ cubs are killed (which sometimes the males will do) they will come into heat almost immediately. Like in 20 minutes immediately! 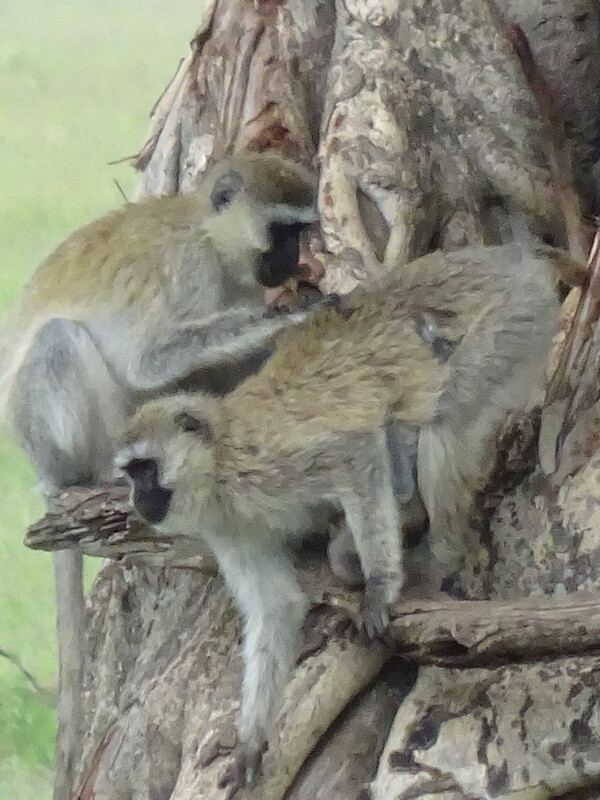 Also, the females raise all their cubs together. They are incredibly social and act just like house-cats, except they kill bigger mice. Here’s a really fun little video we call The Cuddle Puddle. This lioness was watching as her cubs stalked some gazelles across the way – one attacked too early, so no dinner from that try. Most of the males we saw were lounging in the sun like this one…but one was busy gnawing on a wildebeest while another was just finishing up with a little somethin’-somethin’! Cheetah! Just the name sounds exciting! 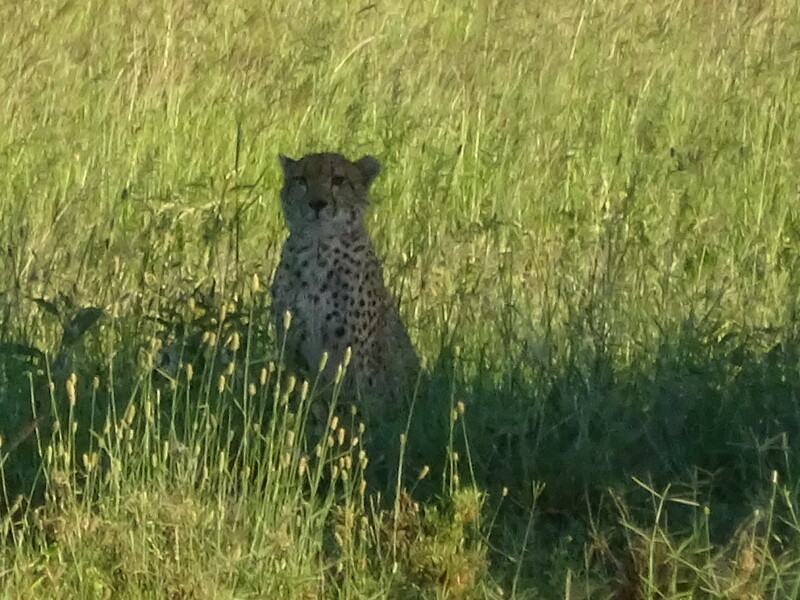 We saw this pregnant female in the water on our very first game drive. Apparently “in the water” is very rare. Not only was Brian, our leader, really excited to see it, I was showing this picture to a guide at our hotel later who couldn’t believe it. So there you have it! From this angle, love how this guy looks so much like Hobbes of Calvin and Hobbes! 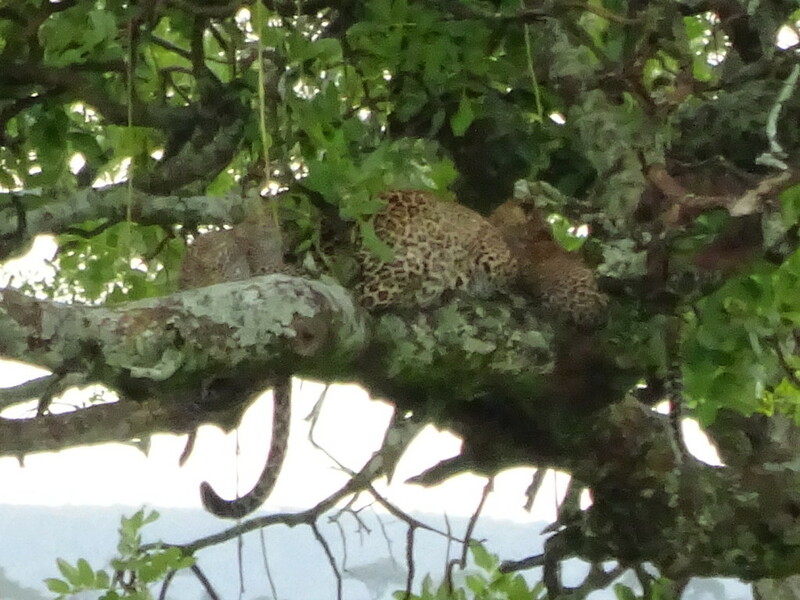 I promise this is a leopard mama and two cubs in a tree. Leopards are pretty rare to find and these were the only ones we saw all trip. They were quite far away, but it was still mighty exciting! Elephants!!! We saw so many elephants it’s impossible to pick just one picture. This was a big family crossing in front of us. 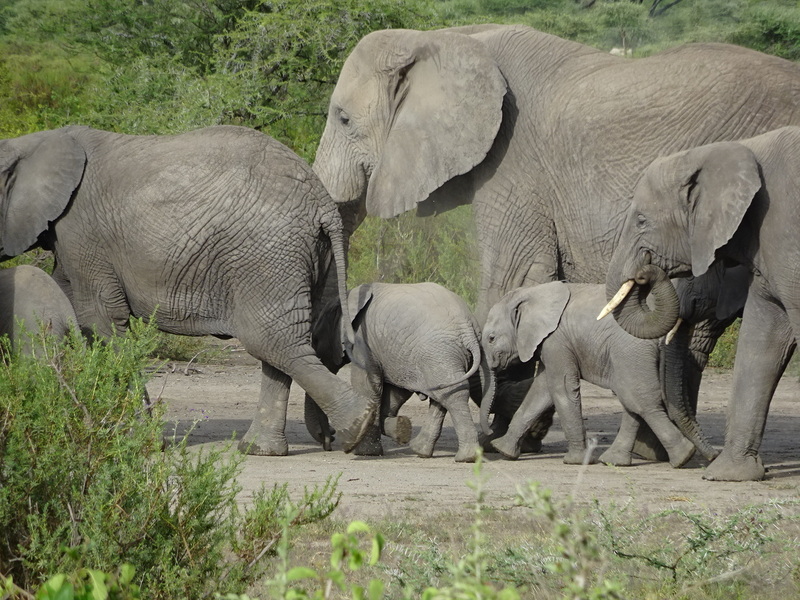 One night we saw multiple herds/families of elephants make their way to a watering-hole. We maybe saw 30-40 that night. What word should I use here? Amazing? Awe-struck? 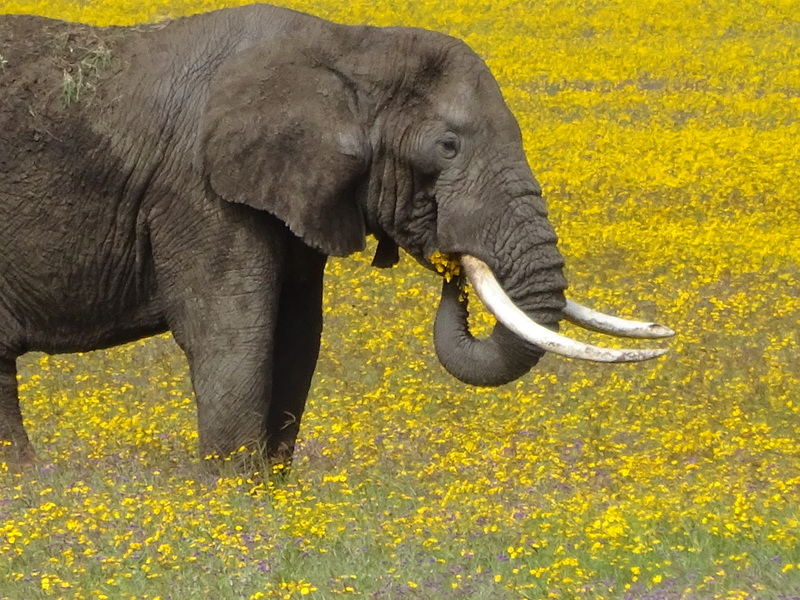 It’s all the more incredible when we learned that one African elephant is killed every 15 minutes. Let that sink in. Pretty depressing, eh? We didn’t get tired of watching these ultra-sensitive and social beasts. I love that Aunties help take care of the kids. Being an auntie is the best, even for elephants I think. Scavengers! Just like dung, imagine if no one cleaned up after the kills? Thanks to vultures, hyenas, jackals (in order below) and others, every single piece of the deceased will be recycled. 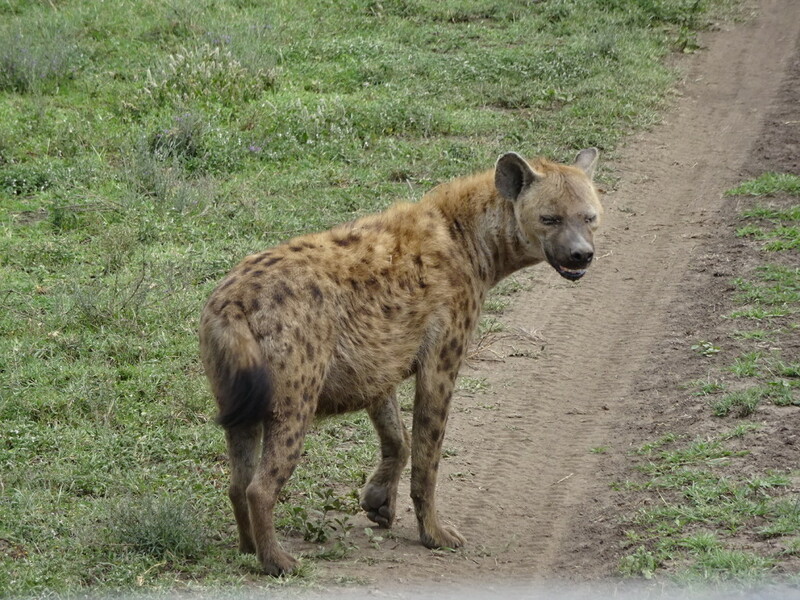 The hyenas were actually pretty fun to watch lope around. 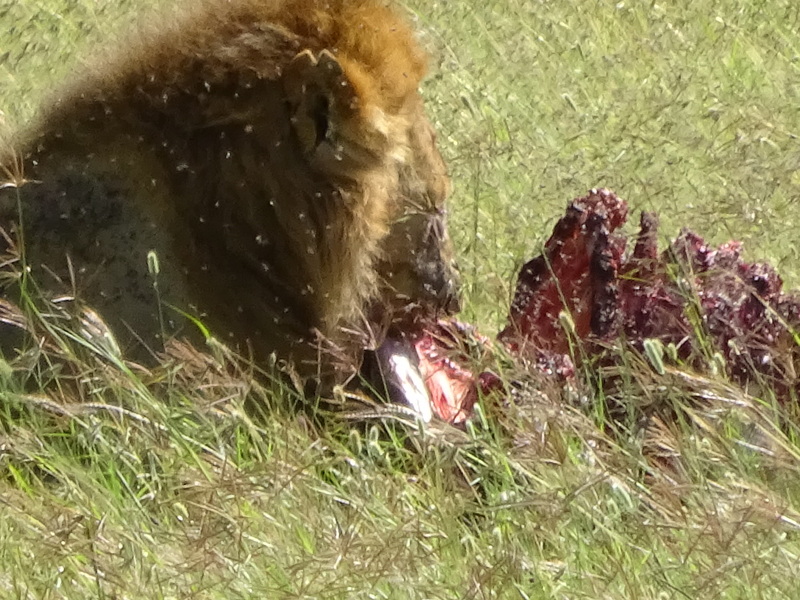 We came across a number of different kills and it was fascinating watching the lions eat first, then one type of vulture would swoop in, followed by other vultures, jackals nipping in to grab when they could and hyenas bulling their way in as well. 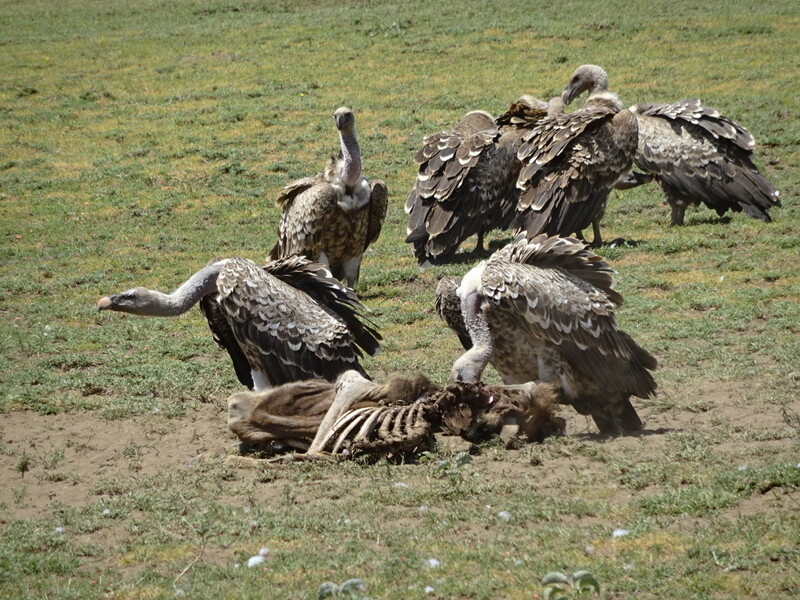 At the very end were other, smaller vultures as well as a certain type of stork. Quite the…umm…pecking order. The Cape Buffalo. A face only a mother could love. They live in groups, sometimes with the grumpy old men of the herd peeling off to be on their own. Some say that the older ones act as sentries or look outs for the herd, willing to sacrifice themselves. Others say they just got distracted eating. 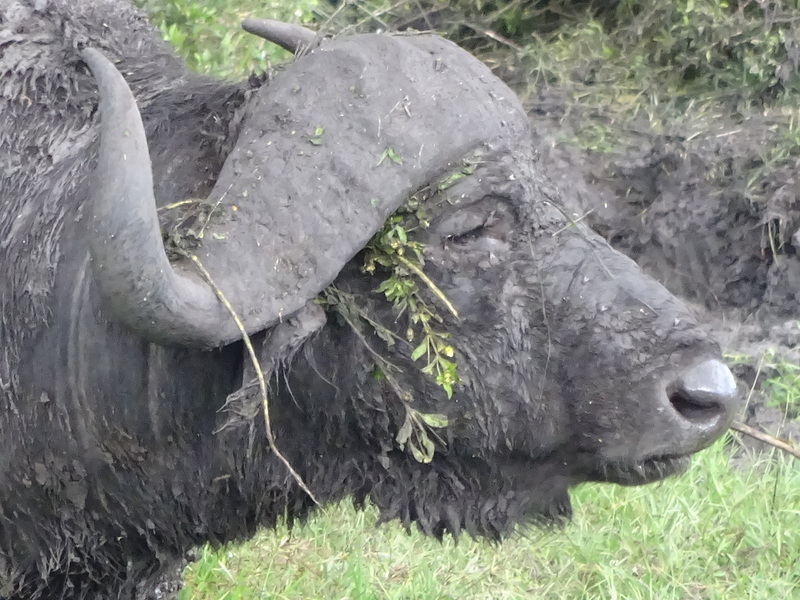 Cape buffalo cover themselves in mud to protect from the flies! Now for the tough ones. These hooved furry friends are hard to keep straight, but I think I got it (thanks to the guide that is staying in our hotel). Grant’s Gazelle and the ever-diplomatic zebra. 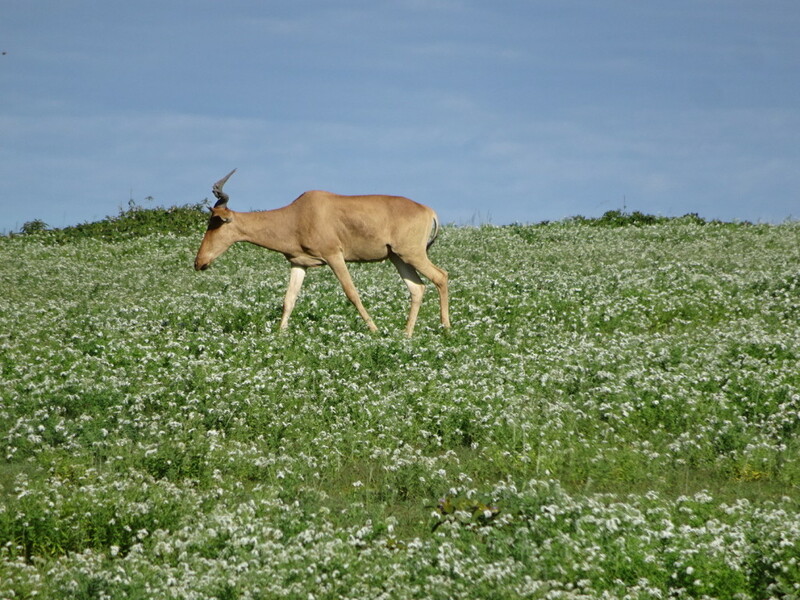 Topi – note the slightly blue patches at their haunches. 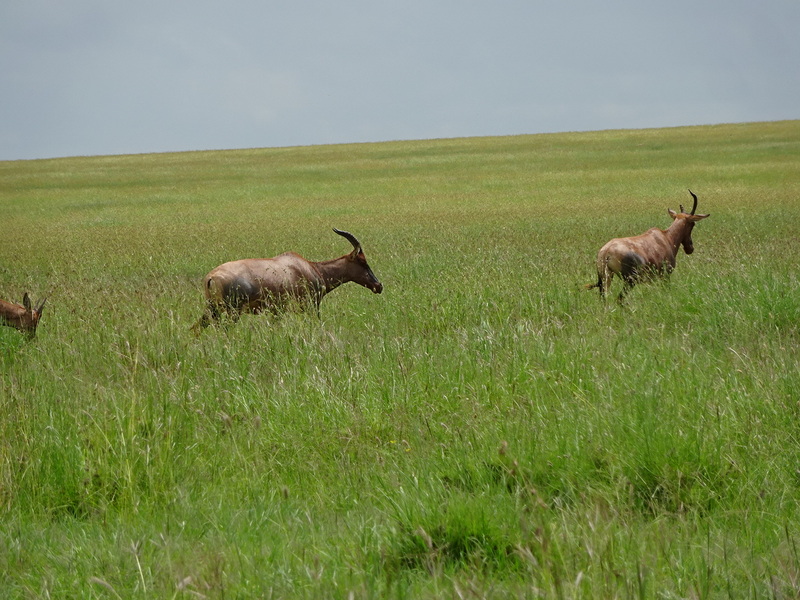 We didn’t see very many of them, but they were Aaron’s favorites of the antelopes, I think ’cause they were slightly tubbier than the others. The one at the right has a broken horn from fighting. Wonder if breaking a horn hurts? 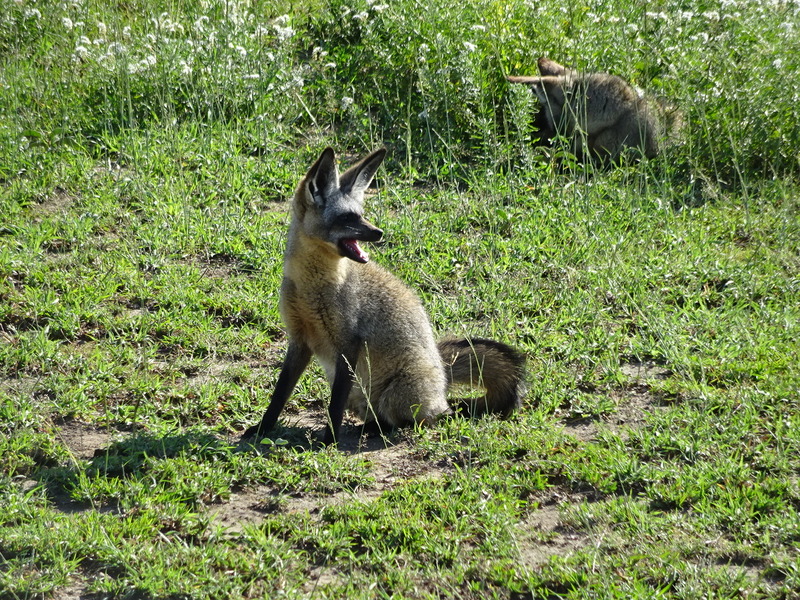 The Bat Eared Fox. We saw these guys twice. I heard they are nocturnal, so maybe ours were confused. They use their big ears to lean against the ground and listen for insects (say termites) and then dig them up and chow down! Cool! Plus, I think they are darn cute. 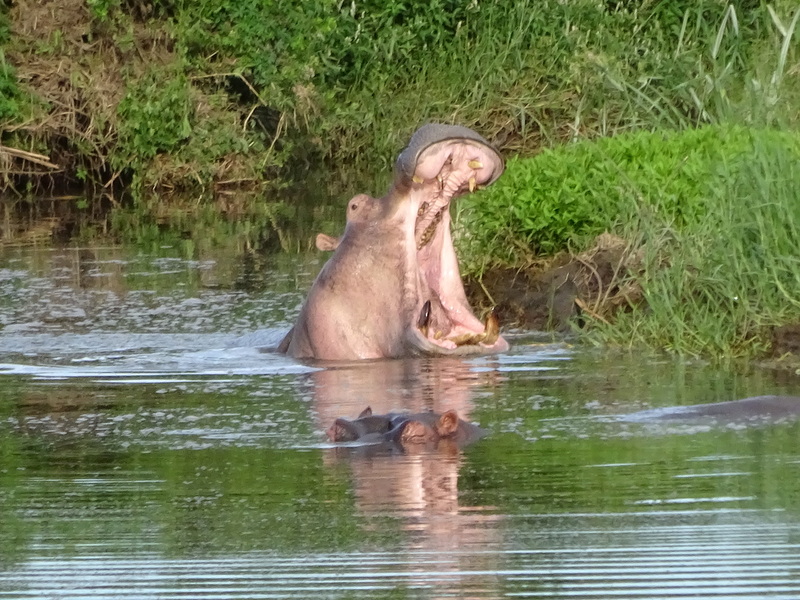 Hippos! We saw a zillion of these guys…mostly just grey humps in the water. 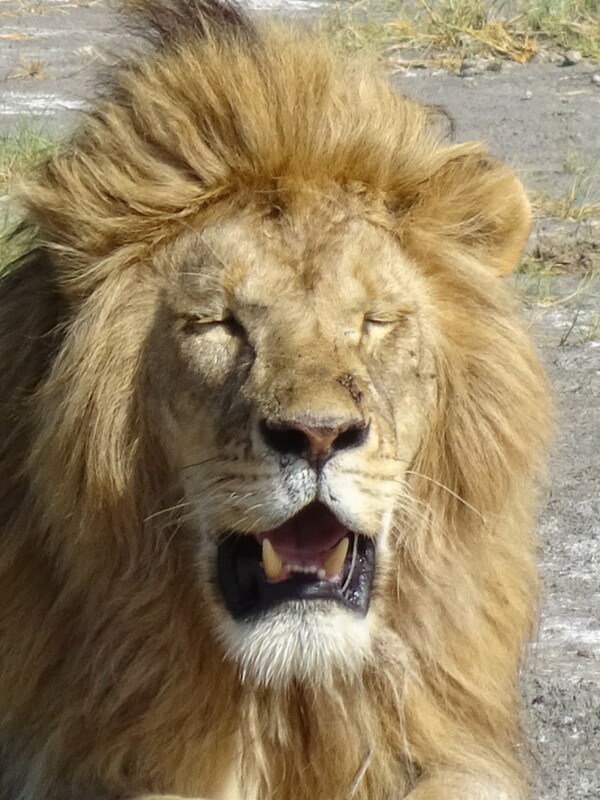 This big yawn is a show of dominance to keep other males away. Well played hippo, well played. 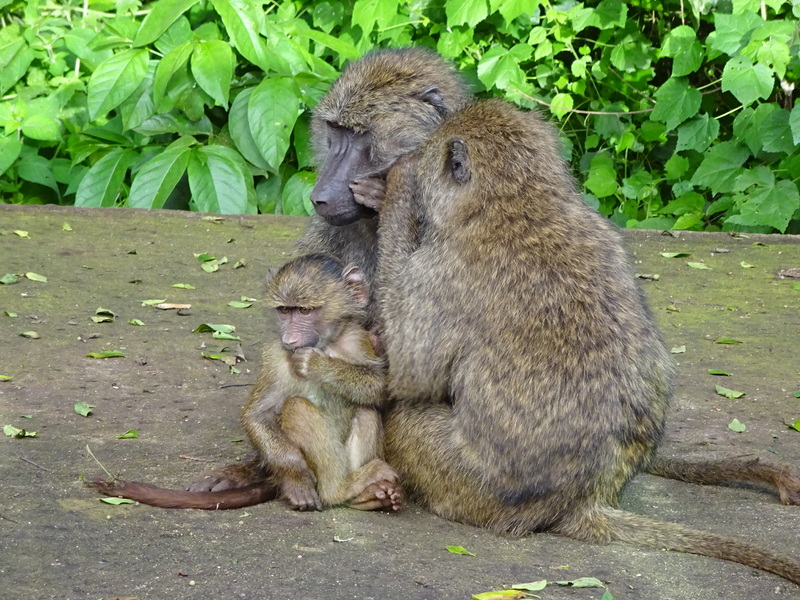 Baboons and Vervet Monkeys. We saw them playing, hugging, and in one case chewing on bubble wrap. More than once these guys snuck into our truck and ate Aunt Casey’s granola bars! Bad monkeys! 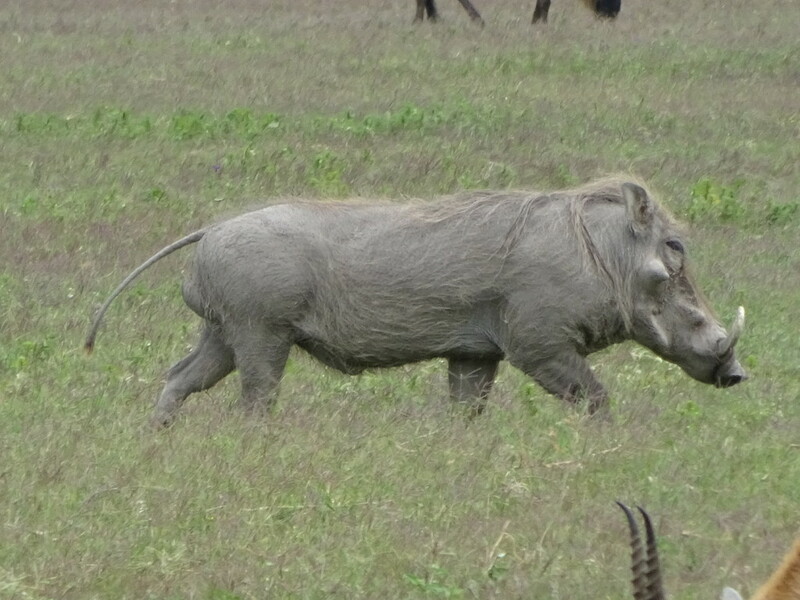 The Warthog. They run in the grass with their tails straight up in the air with a few babies trotting along behind. Cute, once again! 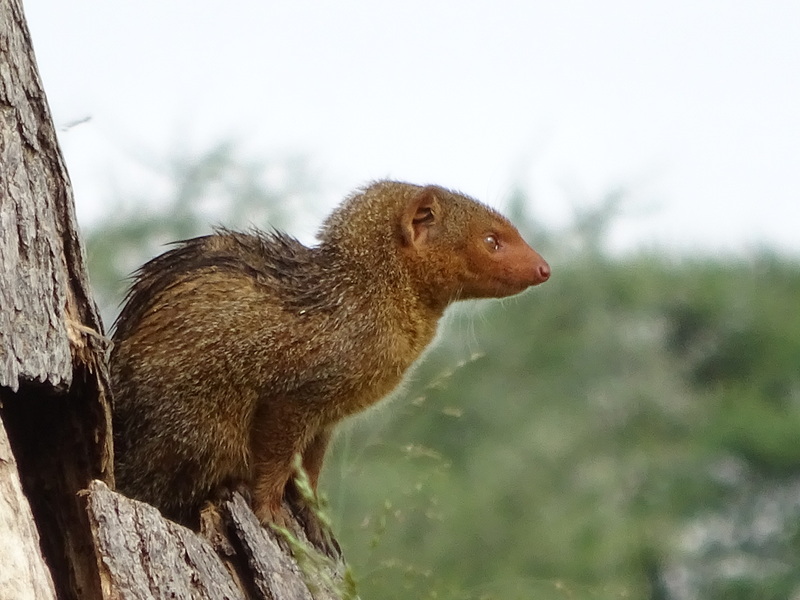 Oh, and rumor has it that their tails are straight up because their skin is so tight that when they close their eyes, which they have to do to protect them from the grass’ pollens, it forces their tails up in the air! No botox needed. We saw 8-10 lumps way far out in the Ngorogoro Crater that turned out to be Black Rhinos. Rhinos are incredibly endangered thanks to Asian organized crime syndicates who poach rhinos for their horns — which, by the way, aren’t actually horns! They’re actually really compact hair that grows in the shape of a horn and has no medicinal value whatsoever. Enticing, eh? In South Africa — with the most advanced conservation programs in Africa – there were 13 poached rhinos in 2007. Last year they lost 1215. 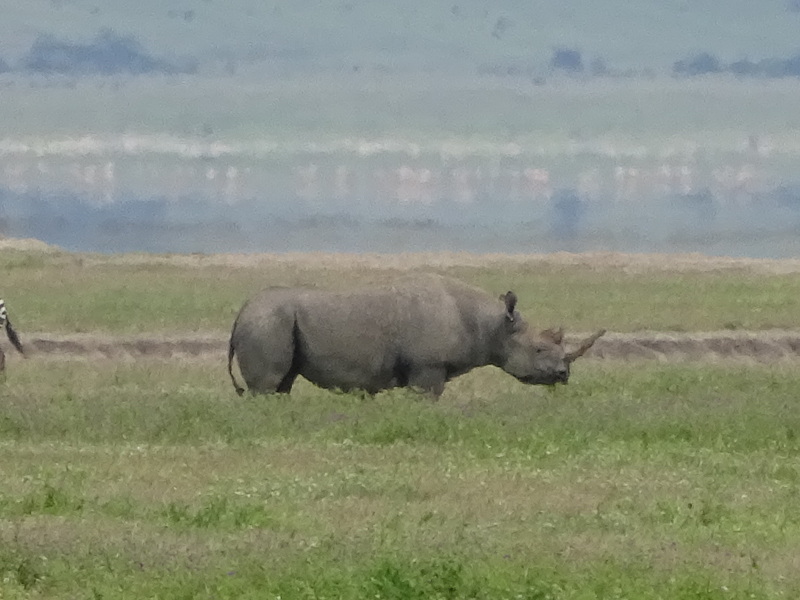 It’s expected that in the next year, deaths will exceed births for rhinos. Not good. Come and see them while you can. We couldn’t get too close and Aaron was at full zoom, but you can just see the flamingos in the background of this fine fellow. 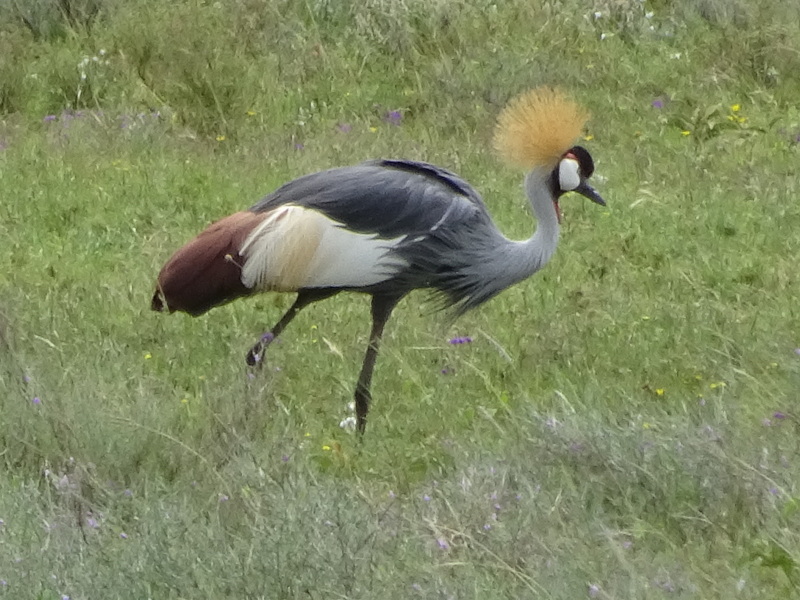 Grey Crested Crane + a million other birds. Being in a truck full of birders, we soon grew an appreciation for all the feathered friends. Here is just one. We plan to post a bird blog so we can give them the time they deserve. I had my fingers crossed for months that we would see it. Spoiler Alert: We Saw It! We Saw It! We Saw It!!!! Eat your heart out PBS Africa Special! We saw the great migration…migrating! That’s when the wildebeest gather (we saw that) and then take off running to the smell of water (we saw that too!). 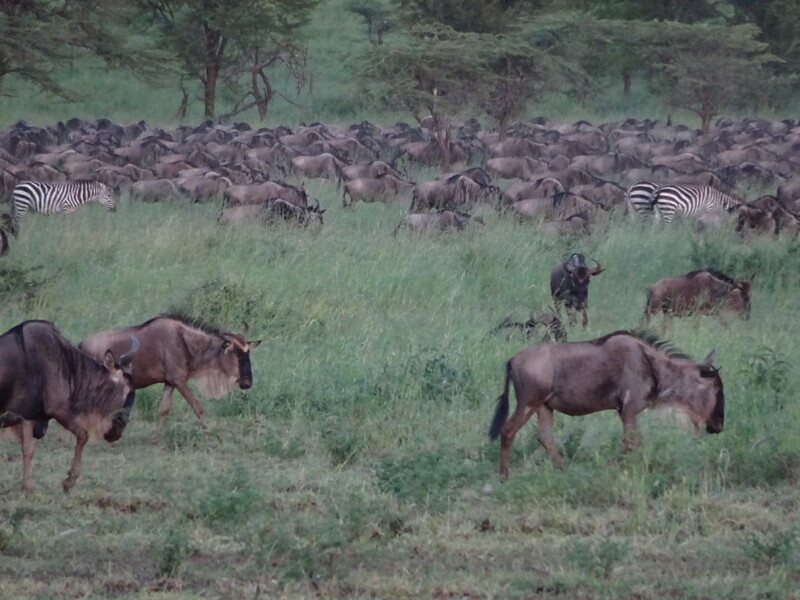 Two MILLION wildebeest make the run. I don’t know how many thousands upon thousands we witnessed, but it was mind-blowing. This was the absolute highlight of the trip for me. 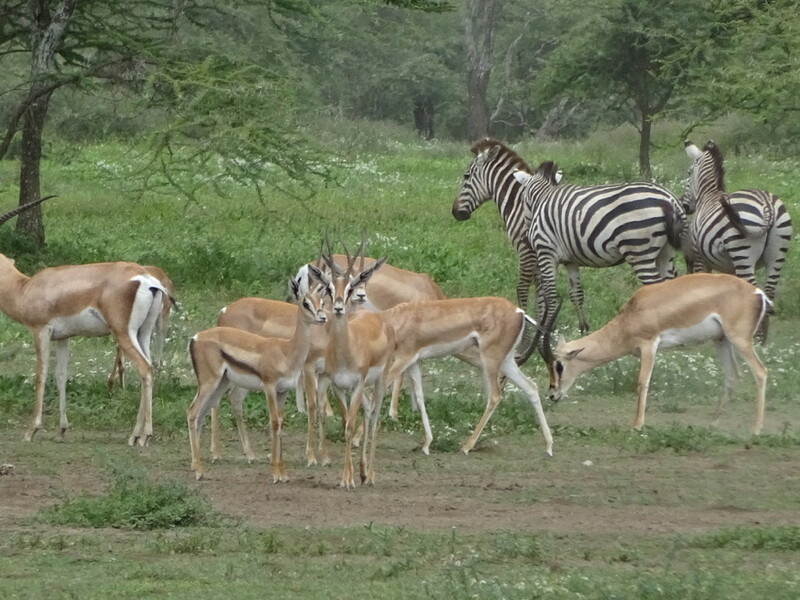 Notice how once again the zebra just make themselves at home? More to come, including videos! That’s it for now. The safari will require a few more blogs to give you an idea of what it was like, but we hope you enjoyed the first round of animals. Can I just say holy crap. That’s a LOT of animals. Must have been absolutely incredible. Thank you for sharing safari with us all. Love it! You don’t know the half of it! Just wait for the migration videos – they’re incredible!!! Our pleasure! Much more to come…though maybe not for a week or two as we’re off to explore the mountains! Wow. I’d write more, but I’m planning my trip to Africa now. Ok, ok, we’ll join you here, but just this once! I love how you’ve captured these great photo sz, and stories, and info! I’m looking forward to the rest, and excited to see things you saw that our truck didn’t. Yes, Awesome!! i teared up reading this blog -from joy for what you are experiencing. 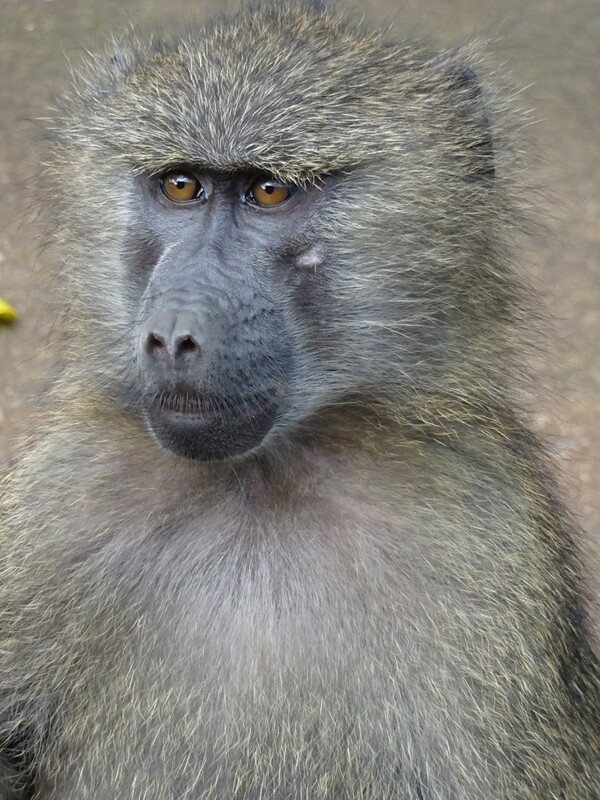 And it’s just continued as we’ve met some wonderful locals here in Arusha post-safari! Next time, though, we’re signing you up for the safari, too!!! Stunning photos! I love the comment about auntie elephants and I totally agree. The matriarchal structure of elephant communities has always been impressive to me. Looks amazing guys. Congratulations on making it to a whole new leg of your incredible journey! Thanks! How funny that we’re just starting a new continent while you’re settling down for awhile. Love how life works that way sometimes! oh wow. I don’t even know what to say except that you guys are awesome for posting all the extra info with those beautiful photos and I can’t wait to see those amazing creatures in person someday. Best blog ever! Awwww! Thanks! We’re already planning the safari jeep with you guys, us and Karen – count us in! Loved looking at all you wonderful pictures and enlightening information. I always hoped that we would go on a Safari but didn’t get to it. Looking forward to the future posts. So glad that your are having such a great time. We ARE having a great time! So great we might have to wait a bit before posting more as we’re about to head off the tourist track and explore some African hill towns over the next week. Glad you could join us vicariously! Hi Anner! Great post and wonderful pictures…I feel like I’ve just finished watching “The Lion King” movie! : ) It’s been so fun following your journey. Thank you for sharing such detailed and interesting posts. Funny you mention The Lion King! While we were driving in the Serengeti, our guide showed us the rock formation that apparently inspired Disney to use for the famous ‘holding up the lion cub’ scene! It really did look like the movie…hmm…that should really be the other way around… Many posts to come and we’re so glad you’re enjoying! Whoa. I can’t even believe it! I am so happy for you guys. I have always wanted to go on safari but I am seriously terrified of the bug situation. Was it bad? 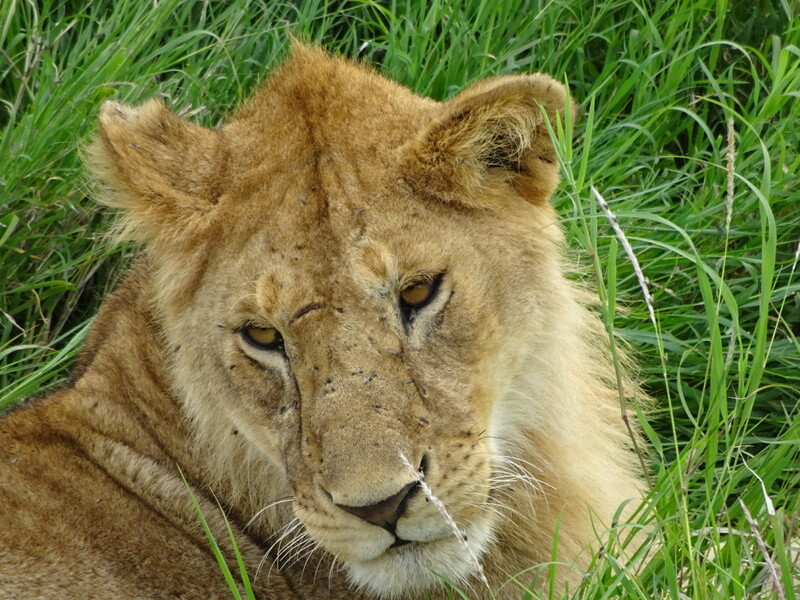 The flies all over those lionesses freaked me out. LOL Were they all over you guys too? Thanks for the great reminders of our 1989 trip! We will be going again in South Africa in November after a trip to India. I like the info that you provide on the unique characteristics of various species. thank you for sharing. 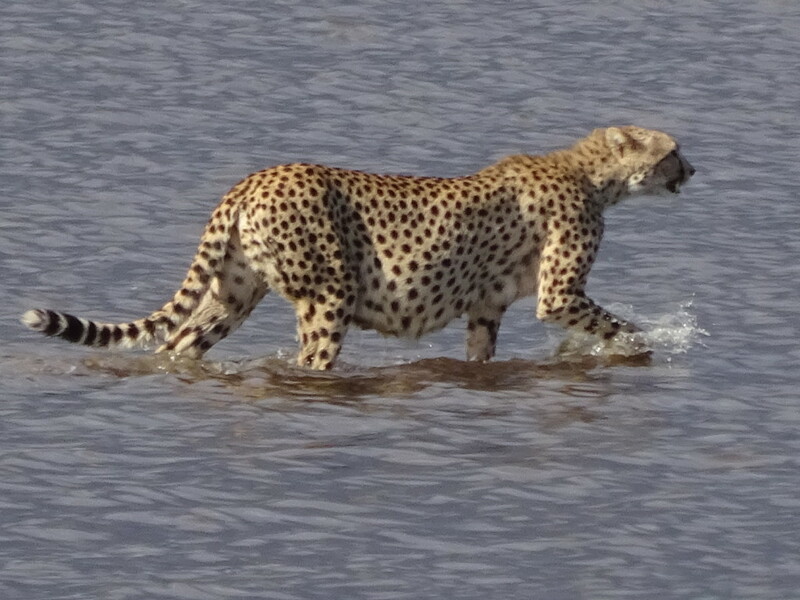 Having experienced a safari with Brian a few years back it is great to see your pictures and read your stories. My friend Evelyn and Val enjoyed your company and shared you blog. Glad to continue following your travels. Our pleasure, Karen, and thanks for joining us! Evelyn and Val were wonderful – both so positive and up for anything! It really turned out to be an amazing group of safarists (safariists?) which made the whole experience that much more incredible. 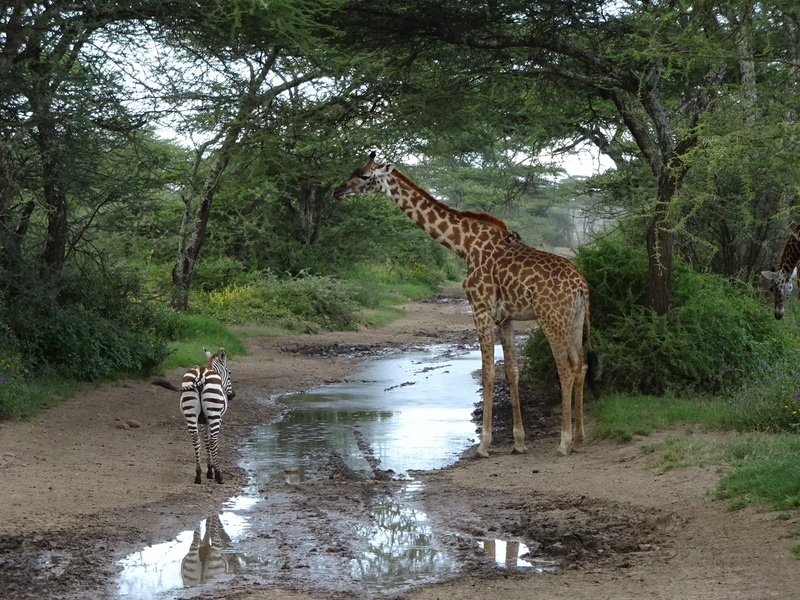 Pingback: No Map Required | Safari Part 3: The Great Migration!